The farm maiden makes the best arroz con leche! In this award-winning story, newly available in paperback, children observe the preparation of the traditional dish as they learn Spanish words and make logical connections. Inspired by “The House that Jack Built,” each rhyme in this cumulative tale builds on the previous one. The Spanish vocabulary words are taught in context, which should help children to remember them longer, and better. The back of the book includes a two-page recipe for arroz con leche, and a glossary of Spanish words used in the text along with their English language definitions and a pronunciation guide. 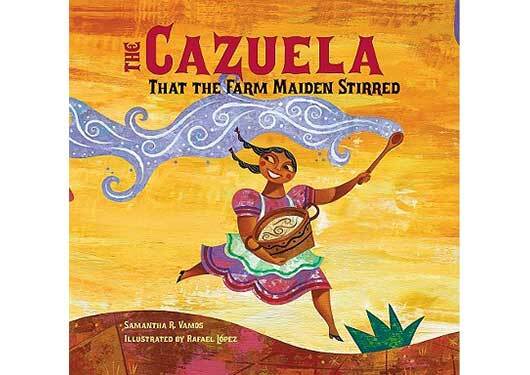 The original hardcover edition of the book won the 2012 Pura Belpre Illustrator Honor Award for its vibrant illustrations and was named a 2012 Notable Children’s Book by the American Library Association (ALA). A wonderful addition to schools libraries, and a perfect choice for the abuelitas in your children’s lives.